This is one of five poems by George Herbert that I performed at The Kennedy Center in 2002. 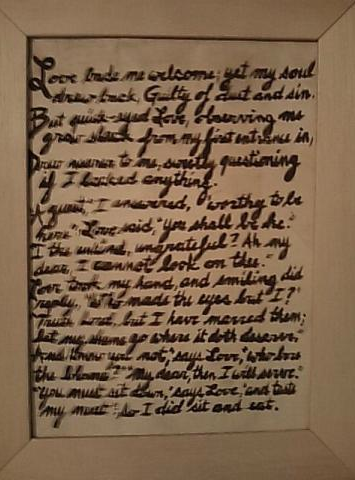 It was hanging on the wall in the room where I stayed while in Chicago with the father of Melissa Lorraine, who performs the one-woman play, Juliet: A Dialogue About Love. Wheaton College Church, where I miraculously performed that night, had asked Melissa's parents if they'd host me. Later he realized Joyce and I had hosted Melissa in '07. I had met her at a speed networking session at a Christians in Theatre Arts conference, there in Chicago. We had two minutes to share about our work. She said, "I'm going to perform at the Fringe Festival this summer." "So am I!" I bellowed. "I'll see you in Edinburgh!" Turns out she was performing at the New York Fringe Festival the same weeks we were performing at the Edinburgh Fringe Festival. So we let her apartment sit. "A guest," I answered, "worthy to be here." On the Christmas card Melissa wrote, "Please forgive the five-year-old quality of this gift...I wish it was just a little bit prettier. But know that the reason this is your gift today is because I finally and fully know Him and I have at long last pulled my chair up to His feast...."
Melissa's dad invited me to read a chapter she wrote in Mere Christians: Inspiring Stories of Encounters with C. S. Lewis. I was sobbing after Melissa's profound retelling of how she found Jesus in a very secular theatre company commune in Hungary by reading pages from C. S. Lewis' book, Surprised by Joy, which her sister had selected for her. Oh, I love the poems! It's so beautiful and touching. I love that poem! My cousin sang the arrangement by Ralph Vaughn Williams at our wedding. That's great, Ellen. I didn't know music had been written to it. Well I performed it to music, but I didn't sing it. It was microtonal music.